From Australia to Zimbabwe, people worldwide are coming together to strategize about and implement measures to secure women’s rights. In cities across Spain millions of women workers marked International Women’s Day with an unprecedented strike demanding gender equality. Icelandic women’s organizations mounted demonstrations outside parliament to secure legislation that guaranteed equal pay for women. Social media has been used to highlight infringements on women’s rights. On Twitter, many women use African-American activist Tarana Burke’s #Metoo as a platform to speak out against sexual harassment and assault. Whether in the streets of Madrid, Reykjavik, Hollywood or Ottawa, women’s movements highlight the pervasiveness of gender-based discrimination. Factors such as race, ethnicity, age, ability, class and sexual orientation have led some women to experience oppression in multiple and intersecting ways. Movements dedicated to the self-determination of women, further marginalized due to their intersecting identities, have taken hold in communities across Canada. Black Lives Matter Toronto upholds the rights and freedoms of African, Caribbean, and Black cis, queer, trans and disabled populations. In 2016, Black Lives Matter staged a demonstration at Pride Toronto to advance the hiring of Black transwomen, Indigenous people and others from vulnerable groups. Just this year, a not guilty verdict in the death of Tina Fontaine, a 15-year-old Indigenous girl whose body was found in the Red River, sparked rallies in cities across the country, demanding justice in a system that fails Indigenous women and girls. These movements challenge us to work in solidarity with women, experiencing compounding forms of oppression, to dismantle the systemic causes of discrimination and organize for gender equality. With gender-based inequality and violence in Canada so widespread, it is essential to equip Ontario students with tools to not only address the systemic nature of gender-based discrimination and violence, but to also propose strategies and actions to achieve justice. It is imperative that we, educators, champion women’s rights and freedoms within and outside the walls of our classrooms. I began my career as a core French teacher eight years ago in a south-eastern Ontario middle school. I worked in a school where the student population reflected my own African-Caribbean cultural and racial identities. Like the students, I spoke Jamaican Créole to friends, family and fellow Caribbean colleagues. In my French classroom, students and I investigated inequities present in our local and global communities. We discussed media reports on Islamophobia, racism, sexism, poverty and violence towards immigrants. The students and I used visual arts and French literacy skills to investigate issues of injustice and to communicate ideas. Last year, I embarked on a new career as an elementary Learning Coach. I collaborate with educator teams, as well as individual teachers, early childhood educators and administrators. I work only in inner-city schools that have been identified through census reports as facing external challenges to student success. These challenges are linked to household income, level of parental/guardian education and family structure. My equity work in inner-city schools has led me on a journey to engage educators and students in feminism. Feminism champions the rights of women to fully contribute at home, at work and in public life, for the betterment of their communities and society at large (OECD, 2017). To achieve this goal, feminism aims to dismantle patriarchy and colonialism to secure equal rights for women and girls. Feminism reveals and critically analyzes the ways that patriarchy privileges men, as well as limits the aspirations, opportunities and rights of women and girls. Feminism also understands that individuals hold multiple identities (Bell, 2016). It recognizes that sexism intersects with other forms of discrimination, like racism, classism, transphobia, ableism and more, to oppress women (Crenshaw, 2015; Bell, 2016). Acknowledging the ways that identities connect, overlap and influence one another has given women, girls and advocates a way to frame their circumstances and fight for their rights, inclusion and visibility (Bell, 2016; Crenshaw, 2015). I mentor/coach Jen Matsalla, an elementary arts teacher. Jen is a white Canadian woman who works in an inner-city school with a large South Asian, Muslim student population. The school is made up of 800 students from junior Kindergarten to Grade 4. She teaches visual arts to students at all grade levels. Almost six hundred students have a primary language other than English and nearly two hundred students have been living in Canada for fewer than five years. For the past 18 years, Jen has used visual arts to build critical literacy skills and confidence among her elementary students. This year, Jen wanted to explore feminism with her visual arts students. She enlisted my support in designing learning tasks around feminism. Jen and I began our journey by reflecting on our own experiences and understandings of feminism. Our reflections informed the lessons we created, which were intended to meet curricular expectations, connect to student realities, foster leadership, disrupt previously held ideas and ignite learning and action for women’s equality. In one lesson, Jen asked students to answer the question, “Who am I?” This question prompted students to think about their own identities. Jen and the students talked about the ways their identities shaped their experiences of privilege and oppression and their views on gender and feminism. Students then wrote an “I am From” poem that reflected not only their multiple identities, but also their experiences and aspirations with respect to women’s equality. Jen exposed students to visual arts pieces by women, such as Frida Kahlo, queer Mexican artist Maya Christina Gonzalez, African-American sculptor Augusta Savage, Afghan graffiti artist Shamsia Hassani and Cree painter Jane Ash Poitras. The students investigated the ways these women's identities and experiences influenced the production and reception of their artwork. Students referred to these artists for inspiration to create their own self-portraits. They used colours, textures and shapes to respond to the question, Who am I? Following the initial reflection on identity, Jen encouraged students to go beyond the walls of the school to deepen their knowledge of feminism. Students connected with families and community members. They spoke to local women they viewed as feminists. Some students identified their mothers, aunts, community leaders and even their babysitters as those who champion women’s rights. The students brainstormed questions. They looked at culturally appropriate ways to conduct interviews. The women who were interviewed also contributed to the development of questions and interview protocol. In the interviews, the women spoke of racism, classism and other forms of discrimination they endured and their fight for equal rights. 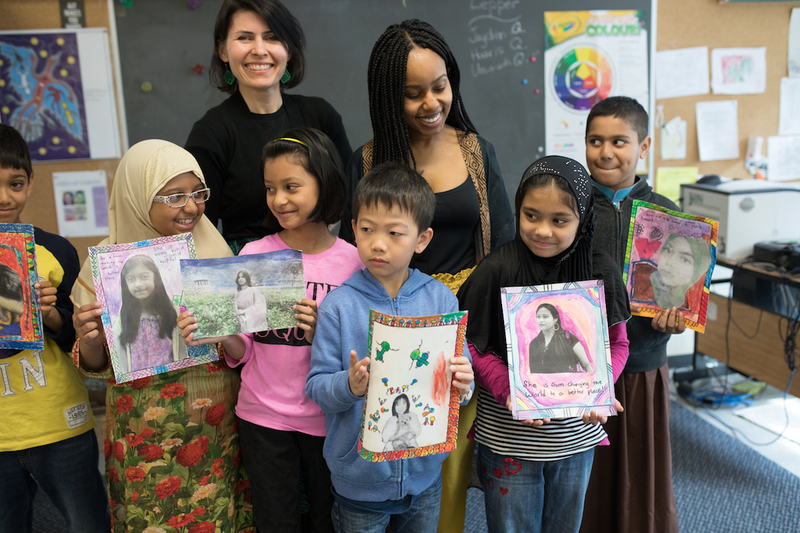 Through their stories, local feminists helped students learn about the ways gender intersects with other identities to shape their oppression and resistance. Based on the interviews, some students wrote “She is From” poems about their local feminists. The poems illustrate the joys and hardships of local feminists working for the rights and freedoms of women. The students used their visual arts skills to create portraits of their local feminists. Jen and her Grade 4 visual arts class planned an art exhibition at their school to showcase the poems and portraits. Open to the community, the exhibition highlighted the ways local feminists work to topple patriarchy and advance women’s equality. At the art exhibition, students urged attendees to recognize local feminists and commit their support to women’s equality. Gender equality is at the heart of a just and inclusive society. Yet women and girls around the world continue to face intersecting forms of discrimination and violence. In response, feminists and allies have come together to lead social movements for women’s rights and freedoms. As educators, we have opportunities to explore with our students the ways oppressive structures, such as patriarchy and colonialism, manifest in day-to-day interactions within the school and larger community. By working with students to acknowledge privilege, identify oppression and determine ways to resist injustice, we help them develop the necessary skills to become activists and lead systemic change. How will you inspire students to become feminists and create an equitable future? Stephanie Fearon is a member of the Elementary Teachers of Toronto.